You know what’s weird? Without planning it, I am putting this page together immediately after my page on Henry Obookiah’s resting place up in Cornwall. 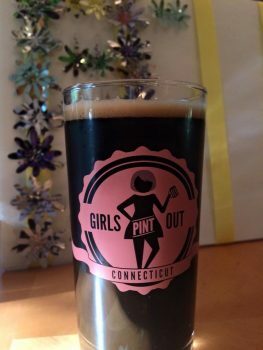 What’s strange about that is that both Venture Smith and Henry Obookiah were brought to New England as kids from faraway lands and are important to us in Connecticut because they both left autobiographies of sorts of their lives. They lived quite different lives, but I can’t help but note the parallels between the two. 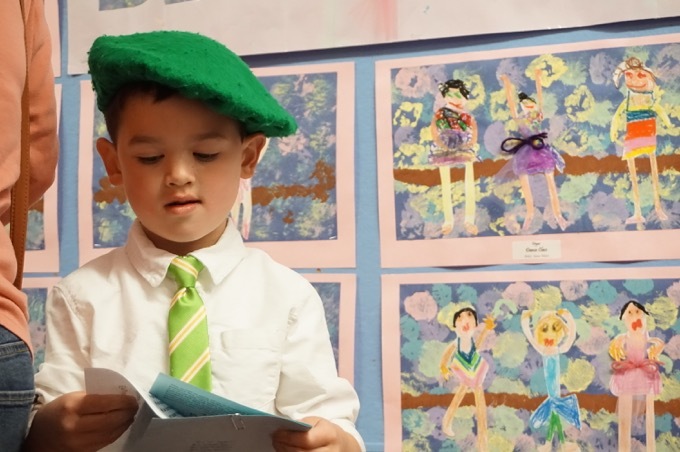 While I recommend you read the Obookiah story, you’re here to learn about Venture Smith. First the particulars for when you take your family on some slave history sight-seeing. 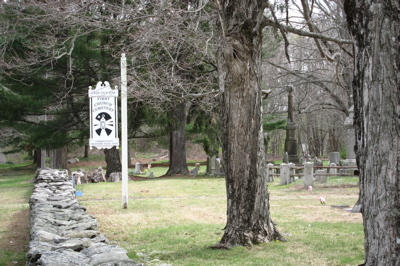 The cemetery is located next to the First Church on route 151 and contains the graves of Venture Smith (1729-1805) and several members of his family. You can’t really miss it driving by as this cemetery is very proud of its place on the Freedom Trail. Smith dictated a pamphlet about his experiences that can be read in the book Five Black Lives. One of his sons served in the American Revolution. His wife is buried next to him, and nearby is the grave of another son, Solomon, who served in the War of 1812. Venture’s granddaughter, who died in 1902, is buried here as well. These stones are located near the wall that is next to the church, about halfway back from Route 151. Wikipedia has a half decent telling of Smith’s life. The links below contain much, much more detail and you really should check them out I’ll add some details from the signs at the grave site. Venture Smith was born Broteer Furro in a place he recalls as Dukandarra in “Guinea”–a term that at the time referred to much of West Africa. Clues in the narrative make it clear that he was from the savannah region — and the fact that he was sold at the seaport of Anomabu, in modern Ghana, suggests that he was probably originally from somewhere in what is now Ghana, Togo, or Benin. He was the son of a prince who had several wives. “Broteer” is a cool name. As a young child, he was kidnapped by a tribe of Africans who were employed by slave dealers. The boy was purchased by Robertson Mumford for four gallons of rum and a piece of calico. Mumford decided to call him Venture because he considered purchasing him to be a business venture. Venture was taken aboard a ship that sailed to Barbados. I know we’ve all read stuff about the slave trade, but just stop and think about that paragraph. We humans are nightmare creatures. Venture relays in his narrative that upon the ship’s arrival in Barbados, over sixty of the original 260 slaves on board had died of smallpox during the trip. Some of the survivors were sold to planters on Barbados, but Venture and a few others were sent to Rhode Island, arriving around 1737. Afterward, Venture went to live at Mumford’s residence on Fishers Island, New York. Once there, he worked in the household. As he grew older, he endured harder tasks and more severe punishments. At the age of twenty-two, Venture married another slave named Meg. Shortly thereafter, he made an escape attempt, convinced to take flight by an Irish indentured servant named Heddy. During their trip, Heddy stole provisions in Long Island, and Venture turned him in. He was returned to his master. In 1752, Venture and Meg welcomed their daughter Hannah. Less than a month later, Venture was separated from his family when he was sold to Thomas Stanton in Stonington, Connecticut. They were reunited the following year when Stanton bought Meg and Hannah. Venture had begun saving money he had earned from working outside jobs and selling produce he grew. He hoped to buy freedom for his family. Venture and Meg had two more children, Solomon in 1756 and Cuff in 1758. Venture was sold twice more. In 1760, he ended up with Colonel Oliver Smith, who permitted him to buy his freedom. The colonel agreed to let Venture work for money when his labor was not required at home. In gratitude, he took Smith’s last name for himself and his family. Finally, around 1765, Venture Smith purchased his freedom for 71 pounds and two shillings. Smith moved to Long Island. In 1769, after cutting wood and living frugally for four years, Smith purchased his sons, Solomon and Cuff. He then purchased a black slave for sixty pounds, but the man ran away without repaying him. Venture Smith suffered his first tragedy as a freedman when Solomon died from scurvy on a whaling expedition in 1773. That same year, Smith purchased his pregnant wife Meg from Thomas Stanton. When the child was born, he was named Solomon, in memory of his deceased brother. With the purchase of his daughter Hannah in 1775, Venture Smith had freed his entire family. Venture Smith spent the remainder of his life in Haddam Neck, Connecticut, on a farm that he bought in 1776. He made a living by fishing, whaling, farming his land, and trading on the Salmon River, located near his residence. He actually purchased a lot of land there and his farm grew to 134 acres with three houses; 20 boats, canoes, and sailing vessels; two fishing businesses and a commercial orchard. His entrepreneurial ventures (get it?) included river trafficking, lumberjacking, carpentry and farming. All of this was accomplished without the ability to read or write. In 1798, Smith relayed his life experiences to Connecticut schoolteacher and Revolutionary War veteran Elisha Niles, who published it. The narrative is the subject of some contention, regarded in many instances as “whitewashed” and inauthentic. It was suspected that the white editor manipulated Smith’s story, a common practice among editors of slave narratives. Regardless, it is one of just eleven slave narratives of the 18th century and the only one that recounts life in Africa. 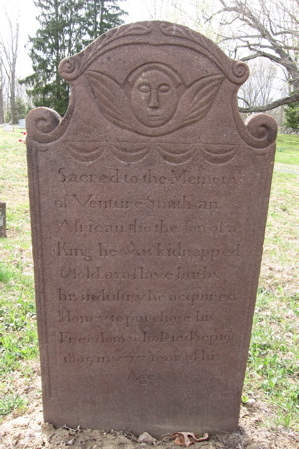 Venture Smith died in 1805. His gravesite was one of the original sites on the Connecticut Freedom Trail and was one of the inspirations for the state to put the whole trail together. On behalf of the Documenting Venture Smith Project I reviewed this entry, on your execelent website, and found a number of errors in the dates, who do I contact to correct them.